NASA's recent purchase of six more round-trip seats on Russian Soyuz spacecraft, a deal worth $458 million, could be the last time the space agency sends a check abroad to ferry U.S. astronauts to and from International Space Station as rampant Russian inflation pushes the price of crew transportation higher, officials said. The latest deal, finalized in April, ensures U.S. astronauts have a ride to the space station through the end of 2017, with provisions for landings into 2018. NASA officials say the deal was necessary to avoid a gap between the end of the previous agreement for Soyuz seats until U.S. commercial spacecraft are ready to take over the job of shuttling astronauts between Earth and the space station. NASA intends to switch its astronauts to U.S.-built commercially-operated spaceships as soon as they complete certification and at least one crewed demonstration mission to the space station, which is expected in the fall of 2017. Operational commercial crew launches to the space station will follow a successful demo flight. Officials revealed plans to extend NASA's contract for crew transportation services from the Russian Federal Space Agency in January, but the parties did not finalize the contract until April, when representatives from NASA and Russia agreed on a price for the Soyuz seats. The contract modification is for six Soyuz seats and associated services for calendar year 2017 with rescue and return services extending through spring 2018, according to Rachel Kraft, a NASA spokesperson. The sole-source deal is worth $457.9 million, or about $76.3 million per round-trip ticket. NASA's relationships with other space station partners usually do not involve cash payments. The European Space Agency, Japan and Canada pay for their share of the space station's operating costs in barter agreements, providing NASA cargo resupply capacity or other services in return for membership in the program. NASA and international partners typically send crews on six-month expeditions on the space station, launching and landing on Soyuz capsules provided by Roscosmos, or the Russian Federal Space Agency. There are no other transportation providers able to carry crews to the space station. Each Soyuz spacecraft has three seats to launch crews from the Baikonur Cosmodrome in Kazakhstan and return them to a parachute-assisted landing on the remote Kazakh steppe. The allotment of Soyuz seats bought by NASA is doled out to U.S., European, Japanese and Canadian astronauts in shares roughly proportional to each partner's financial investment in the space station program. The services included in the Soyuz transportation deal include crew training, rescue, and recovery support. The Soyuz capsules remain docked to the space station during crew expeditions, providing a lifeboat to evacuate the outpost in the event of an emergency. 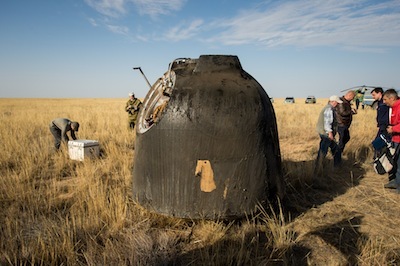 NASA's last Soyuz seat purchase was signed in April 2013, covering six astronaut flights launching in 2016 with landing services through June 2017. The deal was worth $424 million, or about $70.7 million per astronaut seat. Mike Suffredini, NASA's space station program manager, recently told CBS News that the rising price for Soyuz seats was caused by high inflation rates Russia. "My only point to folks is the original price we paid way back when was very fair, and all we've paid is inflation -- Russian inflation -- up to this point," Suffredini told CBS News. "Yes, the price has gone up, but inflation has been higher over there than it is over here." 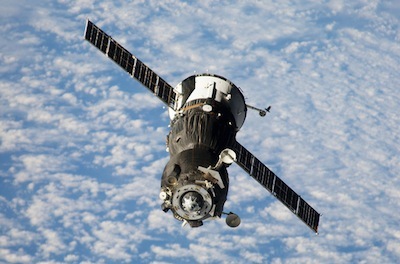 Five years ago, a similar contract signed between Russia and NASA put the price of a single Soyuz seat at $51 million. Suffredini said some imply "the Russians are taking us to the cleaners. I'll still bet you that when you look at the per mission price, it's going to be hard to beat the Soyuz price, but we'll see. I hope not, because we've been telling them they've got to be below that because we're trying to encourage them to give us a cost-effective system." NASA has challenged the three companies vying for the commercial crew job -- Boeing Co., SpaceX and Sierra Nevada Corp. -- to offer the agency's astronauts rides to the space station for less than Russia is charging. NASA's budget requests for the commercial crew program in recent years have not met support in Congress, which appropriated less than what the space agency said it needed to end U.S. reliance on Russia to launch astronauts as soon as possible. NASA officials say they still believe a commercial crew contractor will be operational by the end of 2017, assuming Congress pays the bill. Space station managers are trying to find the right point to cut off the procurement of Soyuz seats and begin buying tickets on commercial crew vehicles. They want to avoid purchasing more Soyuz seats than NASA needs or ending transportation deals with Russia too soon, leaving U.S. access to the space station at risk if commercial providers run into development delays. Space station officials have said they need to buy Soyuz seats about three years ahead of time. Boeing's CST-100 crew capsule, SpaceX's Dragon spacecraft, and Sierra Nevada's Dream Chaser space plane can accommodate a seven-person crew on each flight -- or fewer astronauts if NASA elects to put more cargo on-board. "It's just difficult," Suffredini told CBS News. "You already know what the rocket's going to cost and the spacecraft, that's an expensive piece of hardware."